Now that we’ve familiarized ourselves with Segale personally, let’s get back to basics. How do we know that Mario Segale was Nintendo’s landlord? And how did the world hear about the Mario naming story to begin with? To clear up the landlord issue, we simply have to dig into historical records. Thanks to the online US Trademark database, we can easily find Nintendo of America’s address in the early 1980s, and guess what? It matches a building owned by Mario Segale. So Segale was definitely Nintendo’s landlord in 1981. As for the story, we have to trace it back to its roots in our culture. It first gained wide attention thanks to journalist David Sheff’s provocatively-titled 1993 book Game Over: How Nintendo Zapped an American Industry, Captured Your Dollars, and Enslaved Your Children. Yes, that’s really the title. To explain the following passage, we must set the scene. It’s 1981, and Nintendo’s struggling American branch, Nintendo of America (NOA) has rented a warehouse in Washington as its headquarters. NOA is about to distribute Nintendo’s new Donkey Kong arcade game in the United States. The game stars an enormous gorilla and a pudgy red and blue protagonist Nintendo nicknames “Jumpman,” who is a carpenter by trade (Mario did not become a plumber until the Mario Bros. Arcade game in 1983). Minoru Arakawa, President of NOA, badly needs a hit game to save his troubled American operation. It seems that Donkey Kong will do the trick. They were trying to decide what to call the rotund, red-capped carpenter, when there was a knock on the door. Arakawa answered it. Standing there was the owner of the warehouse. In front of everyone, he blasted Arakawa because the rent was late. Flustered, Arakawa promised that the money was forthcoming, and the man left. It should be noted that there are three problems with Sheff’s account: one, there’s a reference to “Super Mario,” a character power-up idea that only came about in relationship to 1985’s Super Mario Bros. on the Famicom, so the entire NOA staff wouldn’t have spontaneously exclaimed “Super Mario!” in 1981. More notably, Sheff misspells Segale’s name as “Segali.” In my mind, this was likely a transcription error from a verbal interview that Sheff conducted. Thanks to Sheff’s one-letter mistake, the Internet is littered with tens of thousands of erroneous instances of the “Mario Segali” spelling in Mario origin stories, further confusing the issue. Third, Sheff’s story implies that Segale barged in just at the very moment when NOA was deciding what to call Mario. This is almost certainly a dramatic exaggeration, since later, less sensational accounts favor the “gradual nickname” version of events. [Nintendo President Hiroshi Yamauchi] called his son-in-law [Minoru Arakawa, president of Nintendo of America] and told him that a new game was coming that would make Nintendo one of the hottest game companies in American arcades. The news could not have come at a better time. [Nintendo of America] had nearly bankrupted themselves, and Arakawa was having trouble covering the costs of his floundering operation. Around this time, Mario Segale, the landlord of Nintendo’s warehouse, visited Arakawa to complain that the rent was late. After threats and angry words, Segale accepted Arakawa’s promise that the money would arrive shortly. Arakawa later immortalized Segale by renaming Jumpman, the carpenter in Donkey Kong, Mario. I recently asked Kent about the source of this information, and he says he likely took it from David Sheff’s book originally, but he’s fuzzy about it because he wrote it twelve years ago. 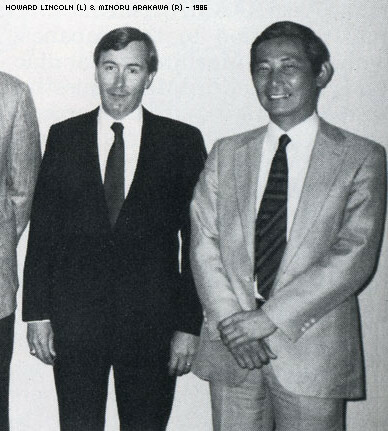 Kent is sure, however, that he ran all of his Nintendo chapters past both Howard Lincoln (legal counsel for NOA in 1981, later Chairman) and Minoru Arakawa. They had no complaints. I contacted Minoru Arakawa myself, but he declined to be interviewed on this topic. Interestingly, neither Sheff nor Kent say that NOA named the character Mario because of a physical resemblance to Segale. That element of the story seems to have come from interviews with Shigeru Miyamoto, which we’ll discuss in a moment. With these dramatic, simplified stories in mind, it might be obvious why (aside from associations with a childlike cartoon character), Segale isn’t itching to step out and claim the limelight as Mario’s inspiration. Put yourself in Segale’s shoes: would you be happy about the antagonistic role you played in this classic tale of overdue rent? Furthermore, in Sheff’s account (the first one that caught the eye of the press), it’s almost as if Nintendo was mocking Segale by naming their character after him. Ah yes, mocking. That brings us to another reason Segale might not be too thrilled with Nintendo’s mascot: the exaggerated Italian stereotypes baked into Nintendo’s one-note Mario character. In modern Mario games, the character delivers plenty of simple-minded one liners (voiced by Charles Martinet) in a very thick, very silly Italian accent. (Think: “It’s-a me, Mario!”) At least Mario isn’t constantly seen scarfing down pizza and pasta–unless you count the entire run of the Super Mario Bros. Super Show. Unless Nintendo officially acknowledges Segale’s role in the Mario origin story–and unless Segale steps out and talks more about it — this tale will continue to retain more than a hint of legend and lore. In my research, I have never found a reference to Nintendo of Japan officially acknowledging the Mario Segale/Mario character connection. The possible reasons for Nintendo’s behavior range from conspiratorial to mundane. I suspect (and this is pure conjecture on my part) that Nintendo is reticent about making the Segale/Nintendo connection publicly due to possible legal or financial implications of using Segale’s first name, Italian heritage, and likeness for its extremely lucrative video game character. You might recall the “I’m still waiting for my royalty checks,” quote from Segale, which, while portrayed as humorous, probably didn’t inspire confidence in Nintendo.